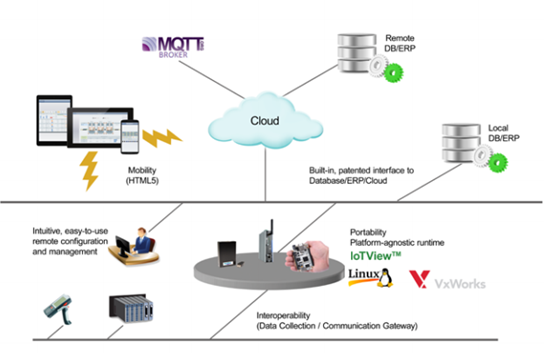 There are many applications where one may consider connecting IoTView embedded HMI to a relational database or Wonderware Online. This include physically dispersed applications in the infrastructure industry, smart cities applications or even traffic light controls system and farming smart irrigation systems to name a few. 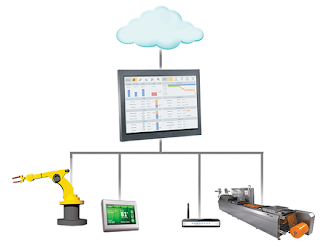 IoTView It is the perfect solution for embedded HMI on the plant floor or IoT / Industry 4.0 solutions designed for the embedded operating systems such as Linux & VxWorx. 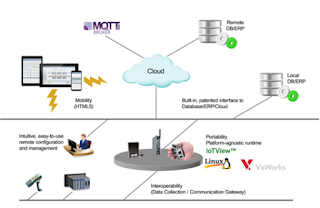 It can be used as a standalone product (InTouch Machine Edition IoTView), or integrated with Wonderware Online (see below) cloud architecture or local data collection for limitless capabilities. The Studio Database Gateway is an application that provides a communication link between applications designed with InTouch Machine Edition and SQL Relational Databases (or Historians). Wonderware Online is a high-performance process historian, capable of storing huge volumes of data generated from today's industrial facilities. This data historian easily retrieves and securely delivers information to desktop or mobile devices, enabling organizations to analyze processes anywhere at any time. The Wonderware Online helps minimize capital and IT costs with its SaaS (software as a service) offering.